For some reason, you might want to build the image libraries liblept uses. The process involves downloading and extracting the library sources, building them, and then copying the required header files to BuildFolder\include, and the libraries to BuildFolder\lib. zlib has no other dependencies. A Visual Studio solution file is provided. libpng can also build zlib but we build zlib separately. libjpeg has no other dependencies. A Visual Studio 2010 solution file is provided. libtiff depends on libjpeg and zlib. Only a nmake file is provided. giflib has no other dependencies. In particular you can’t even mix and match libraries built with references to the Multi-threaded Debug DLL (/MDd) runtime library with those built with references to the Multi-threaded DLL (/MD) runtime library. This is the reason why the libraries built in this section have such long filenames. They are needed to make sure that only libraries referencing the same runtime library are used together. To diagnose these kinds of issues you can use dumpbin /directives somelibrary.lib from the command line to see which runtime library somelibrary.lib was built to use. Use dumpbin /imports somelibrary.dll to check dynamic-link libraries. The /MD and /MDd switches were chosen because the /clr option which enables linking with .NET languages can only be used with those runtime libraries. See C Run-Time Libraries for more details. Download zlib125.zip and extract its contents to BuildFolder\zlib. Note that the libpng.sln provided with libpng requires zlib to be in this location. At this point you might want to empty your include and lib directories to get rid of any files that were supplied with the pre-built binaries archive. Open a Command Prompt window and execute C:\Program Files\Microsoft Visual Studio 9.0\VC\bin\vcvars32.bat to set some environmental variables correctly. to assemble the asm files required for the zlib Release configuration. Using Visual Studio 2008, open BuildFolder\zlib\contrib\vstudio\vc9\zlibvc.sln. Select the desired build configuration (either Debug or Release and probably Win32). Right-click zlibstat and choose Properties. Change Configuration Properties | C/C++ | Code Generation | Runtime Library to either Multi-threaded Debug DLL (/MDd) if building a Debug configuration or Multi-threaded DLL (/MD) if building a Release configuration. Also remove ZLIB_WINAPI from Configuration Properties | C/C++ | Preprocessor | Preprocessor Definitions. If you don’t do this you’ll get undefined symbol error messages when trying to build libpng and libtiff. Copy zlib\zlib.h and zconf.h to BuildFolder\include. To test the zlib static library, you first have to change the testzlib project (the supplied project just directly includes the .c source files instead of linking with the static library). From its Source Files solution folder, remove all files except for testzlib.c. Then right-click testzlib and choose Properties. Change Configuration Properties | Linker | General | Additional Library Directories to x86/ZlibStatRelease. To Configuration Properties | Linker | Input | Additional Dependencies add zlibstat.lib. Right-click testzlib and choose Properties. Change Configuration Properties | C/C++ | Code Generation | Runtime Library to either Multi-threaded Debug DLL (/MDd) if building a Debug configuration or Multi-threaded DLL (/MD) if building a Release configuration. Also remove ZLIB_WINAPI from Configuration Properties | C/C++ | Preprocessor | Preprocessor Definitions. Change Configuration Properties | Linker | Manifest File | Generate Manifest to Yes, otherwise when you attempt to run testzlib.exe you’ll get a “MSVCR90.dll was not found” error. Right-click testzlib and choose Build. Open BuildFolder\lpng143\projects\visualc71\libpng.sln (Just click Next thru the Visual Studio Conversion Wizard). There are five different configurations you can build. Normally you’ll want LIB Release or LIB Debug. To be compatible with the way the other library Debug versions are built, you might want to change the LIB Debug Configuration Properties | C/C++ | General | Debug Information Format from Program Database for Edit & Continue (/ZI) to C7 Compatible (/Z7). This embeds debug information directly in the generated .lib so you don’t have to worry about also copying .pdb files. The libpng project erroneously includes a dependency on the zlib project, so you’ll get an error message about not being able to find gzio.c. Since you previously made zlib separately (specifically to avoid this problem), you can ignore this message. Copy lpng143\png.h and pngconf.h to BuildFolder\include. You can test libpng by building pngtest.exe. Right-click pngtest and choose Properties. Change Configuration Properties | Linker | General | Additional Library Directories to ..\..\..\lib. To Configuration Properties | Linker | Input | Additional Dependencies add zlib125-static-mtdll-debug.lib. Build and run pngtest by right-clicking it and choosing Build. Unfortunately, as of jpeg-8b Visual Studio 2008 is no longer supported, only Visual Studio 2010. This seems a bit premature to me but the solution recommended by the developers is to download jpeg-8a and copy the required solution and project files. Therefore, I supply a Visual Studio 2008 Solution for jpeg-8c in leptonica-1.68\vs2008\jpeg-8c-vs2008.zip. Extract it to BuildFolder\jpeg-8c. and/or copy BuildFolder\jpeg-8c\Debug\jpeg.lib to BuildFolder\lib. Rename it to: libjpeg8c-static-mtdll-debug.lib. Copy jpeglib.h, jconfig.h, jmorecfg.h, and jerror.h to BuildFolder\include. Select the Release and probably Win32 build configuration. Make a new directory called BuildFolder\jpeg-8c\bin and copy BuildFolder\jpeg-8c\cjpeg\Release\cjpeg.exe, BuildFolder\jpeg-8c\djpeg\Release\djpeg.exe, and BuildFolder\jpeg-8c\jpegtran\Release\jpegtran.exe to your new BuildFolder\jpeg-8c\bin directory. Copy all the test images from BuildFolder\jpeg-8c to BuildFolder\jpeg-8c\bin. After a long quiet period, libtiff is undergoing a flurry of changes so it seems best to get the latest version (currently 3.9.4). Building the Software under Windows 95/98/NT/2000 with MS VC++ explains the overall process of building libtiff. However, in order to use the correct include and lib dirs, and allow creation of Debug builds without manual editing of the nmake.opt file, I supply leptonica-1.68\vs2008\libtiff3.9.4-vs2008-makefiles-for-leptonica.zip which contains custom versions of Makefile.vc, nmake.opt, libtiff\Makefile.vc and tools\Makefile.vc. Extract libtiff3.9.4-vs2008-makefiles-for-leptonica.zip to BuildFolder\tiff-3.9.4. This will overwrite the existing versions of the above files so you might want to back them up first. To build libtiff, open a Command Prompt window and first execute C:\Program Files\Microsoft Visual Studio 9.0\VC\bin\vcvars32.bat to set some environmental variables correctly. The last nmake command copies the required libtiff header files and the library to the BuildFolder\include and BuildFolder\lib directories. (Optional but recommended) To build the tiff tools, cd to the BuildFolder\tiff-3.9.4 directory. You can’t build the tiff tools and libtiff together initially because the linker expects to find .pdb files where the .lib is. Thus you first have to make and install libtiff394-static-mtdll(-debug).lib so that the linker can find libjpeg8c-static-mtdll.pdb and libjpeg8c-static-mtdll-debug.pdb. I supply a Visual Studio 2008 Solution for giflib in leptonica-1.68\vs2008\giflib4.1.6.zip. Extract it to BuildFolder\giflib-4.1.6\windows. giflib requires stdint.h Before building it you’ll need to download http://www.azillionmonkeys.com/qed/pstdint.h, rename it to stdint.h, and then move it to the standard Visual C++ include directory: C:\Program Files\Microsoft Visual Studio 9.0\VC\include. /D "WIN32" /D "WINDOWS32" /D "_DEBUG" /D "_LIB" /D "_OPEN_BINARY"
/D "HAVE_IO_H" /D "HAVE_FCNTL_H" /D "HAVE_STDARG_H" /D "HAVE_BASETSD_H"
/D "HAVE_STDINT_H" /D "HAVE_SYS_TYPES_H" /D "_MBCS"
/FD /EHsc /RTC1 /MDd /Fo"Debug\\" /Fd"Debug\vc90.pdb"
/D "WIN3" /D "WINDOWS32" /D "NDEBUG" /D "_LIB" /D "_OPEN_BINARY"
/FD /EHsc /MD /Fo"Release\\" /Fd"Release\vc90.pdb"
Screen Size - Width = 320, Height = 200. ColorResolution = 4, BitsPerPixel = 5, BackGround = 0. Image Size - Left = 0, Top = 0, Width = 320, Height = 200. The include\leptonica\environ.h that is part of the pre-built binary package already has GIF support enabled. However, if you are building from the official distribution of liblept you have to turn on giflib support yourself. Copy the changed leptonica-1.68\src\environ.h to BuildFolder\include\leptonica. Any applications that statically link with either liblept168-static-mtdll.lib or liblept168-static-mtdll-debug.lib will also have to be linked with giflib now. This is already done with the supplied ioformats_reg project but we’ll demonstrate the process anyway by building a LIB Debug version of gifio_reg to make sure the library was built correctly. See Using the Create Leptonica prog Project AddIn to create a Visual Studio 2008 Project for leptonica-1.68\prog\gifio_reg.c. In Solution Explorer right-click gifio_reg, then choose Properties from the context menu. Set Configuration: to LIB Debug. Right-click gifio_reg and choose Set as Startup Project. Choose Build ‣ Build gifio_reg (Shift+F6). Choose Debug ‣ Start Debugging (F5). 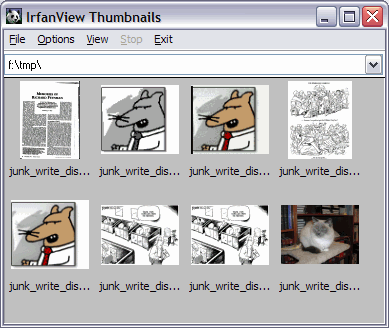 And then an IrFanview Thumbnails window will appear showing you a number of png’s. Hit the Escape key to close the window and exit the program. Since header files may have changed, build liblept by following these instructions. At this point you should build and create ioformats_reg by following the instructions for either the command line or Visual Studio 2008 to make sure all the image libraries were built successfully.